Hanoi (VNA) – Vietnam beat Malaysia 2-0 in a Group A match of the ASEAN Football Federation (AFF) Suzuki Cup 2018, which took place at Hanoi-based My Dinh National Stadium on November 16 evening. 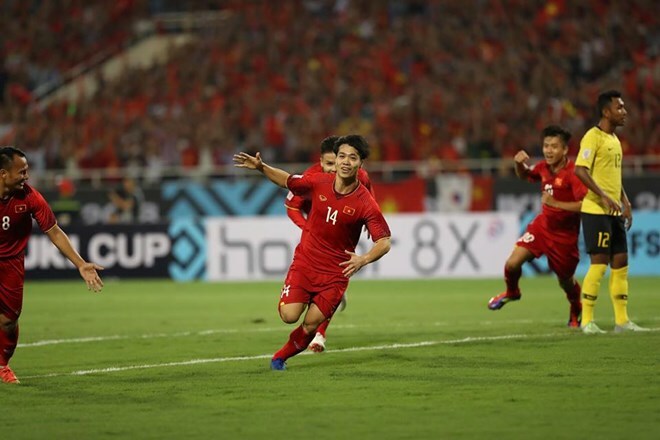 Korean head coach Park Hang-seo made a slight change in Vietnam’s line-up compared to the previous match against Laos as defender Que Ngoc Hai (Number 3) was the team captain instead of Nguyen Van Quyet. At the 11th minute from the whistle, striker Nguyen Cong Phuong (Number 14) gave the home side the lead with a back heel touch. Phuong also opened the score for Vietnam in its match against Laos on November 8. Malaysia proved itself a tough opponent for Vietnam as it increased attacks afterwards and earned higher ball possession in the match. At the 58th minute, goalkeeper Dang Van Lam had a great save to stop a dangerous free kick from the Malaysian side. Two minutes later, striker Nguyen Anh Duc (Number 11) doubled the score for Vietnam with a tidy finish from a pass of midfielder Phan Van Duc, bringing joy for the home spectators. The Vietnam Football Federation (VFF) has worked with the Hanoi Police and My Dinh Stadium’s organising board to ensure security for the match. The organising board will prevent fans from bringing flares into the stadium. On November 8, Vietnam beat Laos 3-0 in its first match of Group A, with goals by Cong Phuong, Anh Duc and Nguyen Quang Hai. Meanwhile, Malaysia previously defeated Laos and Cambodia. The AFF Suzuki Cup 2018 is taking place from November 8 to December 15 with 26 matches among 10 teams. Vietnam’s national football team is in Group A together with fellow South East Asian teams, Malaysia, Myanmar, Cambodia and Laos. This year, the AFF Suzuki Cup will feature a new playing format, with both home and away ties. Vietnam will play Myanmar on November 20 and face Cambodia four days later.